Casa del Lago by linkogecko. Image licensed under Creative Commons Attribution-NonCommercial-NoDerivs 2.0 license. Casa de Lago it is nowadays one of the most traditional venues for culture in Mexico City, thanks to its beautiful French-style building as much their numerous workshops and courses open to the public, despite the fact of being located in the gorgeous Chapultepec Park. On 1908, by orders of president Porfirio Díaz, works began in order to construct a public park in Chapultepec Forest, as part of commemoration of the Centenary of Independence of Mexico. Casa del Lago, as its name indicates, was build next to the one of the lakes created at the same time on the border of Chapultepec Castle hills. In the next years, the building functioned like one of the most important places for parties for politics and members of high society, for philanthropic meetings, and the head office of recently founded Automobile Club. Mexico political instability caused that Casa del Lago for one time were abandoned, Chapultepec Forest headquarters were moved there on 1916, until former president Adolfo de la Huerta decided on 1921 to establish there his particular residence; when he decided on 1923 to postulate him again for presidency, the building was left on hands of Public Education Ministry. On March 1929, Biological Studies Direction of Agriculture Ministry was transferred to Casa del Lago; nevertheless, due lack of budget, the Direction was on a difficult economic situation, despite of having the National Herbarium and a valuable library. 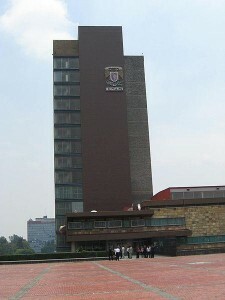 The next year, with just created National Autonomous University of Mexico (UNAM), buildings dedicated to scientific research became part of it, including the Biological Studies Direction, and from that moment was constituted the Biology Institute, and professor Isaac Ochoterena was designated like its first Director. In just five years, dedication and efforts of the Institute allow that it became venue of the VII American Scientific Congress, a good sign of international recognition gained. On 1953 the Biology Institute was moved again, now University City, its present location. 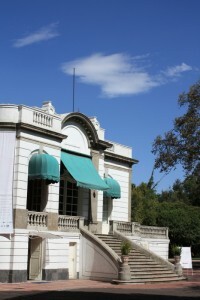 Casa de Lago was abandoned again, until 1959, when Mexico City Local Government and UNAM agreed to create the first cultural building related to UNAM now outside the new campus. Patio del Edificio Carolino by El mundo de Laura. Image licensed under Creative Commons Attribution 2.0 license. 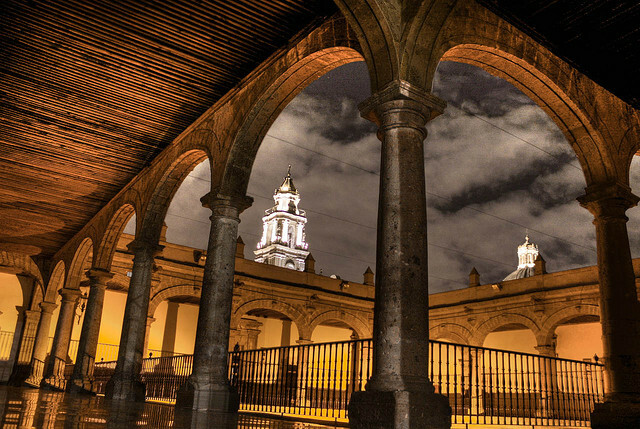 Not so far from Mexico City is Puebla, a place famous for its beautiful centre, plenty of well conserved and beautiful buildings from the Spanish Conquest. Carolino Building is considered one of the oldest and most beautiful buildings in the city. Its aesthetic quality is manifested in its pillars, arches, cornices, window framing, the rails and finials. Its main rooms: the Baroque Hall Auditorium and the Paranymph of exceptional beauty, also in Lafragua library are saved important ancient books of great documentary value. The main staircase is large and is decorated with a series of paintings that recall the patronage of King Charles III. The Royal Caroline College of the Holy Spirit was founded by Melchor de Covarrubias in 1578 and its administration was in charge of the Jesuits. After the order expulsion in 1765 and his return in 1819 were they in charge of several schools teaching, and this was the largest due its magnitude. Guarda historia, Edificio Carolino by El mundo de Laura. Image licensed by Creative Commons Attribution 2.0 license. After Independence was called Imperial College and in 1825 by decree of State Congress its administration pass to Puebla state government. 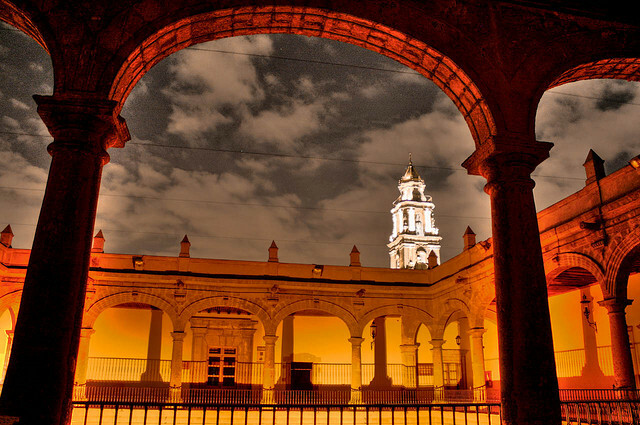 In 1835 it was called State College, changing its name several times until in 1937 he became the University of Puebla and in 1956 founded the now Autonomous University of Puebla, the main scientific and cultural polo of the state and one of the most important of the country. The front of the building of two levels was built entirely with marble, and there are five windows and beautiful boxed bars. 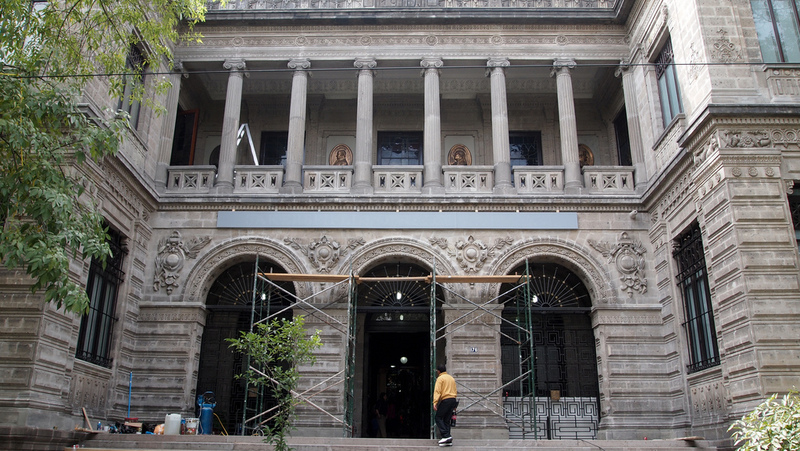 A half of the facade is a plaque dedicated to the Jesuit Juan Gomez. A heavy cornice separates the two levels, with seven balconies and framed windows with jambs, guarded by beautiful wrought iron. In the central top is located the National Emblem on the right arm of the University and Puebla and on the left the shield of the State College. 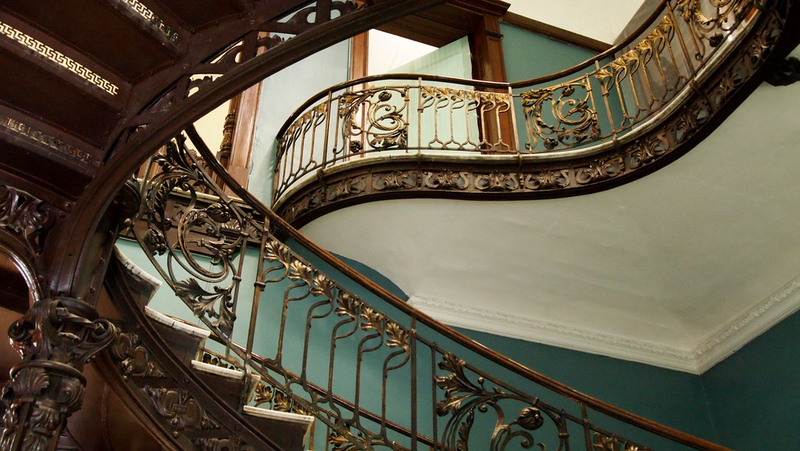 The monumental staircase is formed of three sections in a “Y”, carved in stone gray and iron railing. 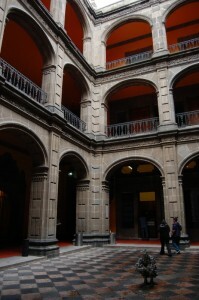 The courtyard is framed by Tuscan columns supporting stone arches, the roof is formed by cross vaults. In the second windows you can admire jambs pediment topped by a small cut. This set is topped by a cornice count uproots a balustrade with vases and gargoyles in the form of cannon. Past the lobby is the second court. Where is a statue of College of the Holy Spirit founder, Miguel Covarrubias. In the place where the domestic chapel was now is the Baroco Hall. The “silería” (a place where subterraneous granaries are made) that adorns it was furnished with Baroque chairs that belonged to the College of Saint Pantaleon. In the background is a wooden altar with images of Melchor de Covarrubias, and bishops Juan de Palafox, Domingo Pantaleón and Idelfonso de la Mota with their Episcopalian shields. The decoration of the vaults is covered by branches and leaves with shell ornaments, fruits, flowers, cloth, scrolls, Plateresque cherubs. On its walls are set of chairs made with cedar on neoclassical style. At the top, in a canopy, the bust of St. Thomas Aquinas, and in the middle part is the coat of arms of the city of Puebla. 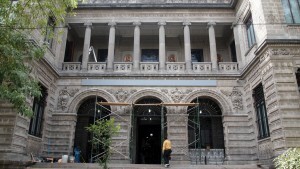 José María Lafragua library holds a number of important collections of old books and its rich literature makes it one of the most important in Mexico. Antiguo Colegio de San Ildefonso (1) by Omar Omar. Image licensed under Creative Commons Attribution-NonCommercial 2.0 license. The Ancient College of San Ildefonso was one of the largest educational institutions in the capital of New Spain. 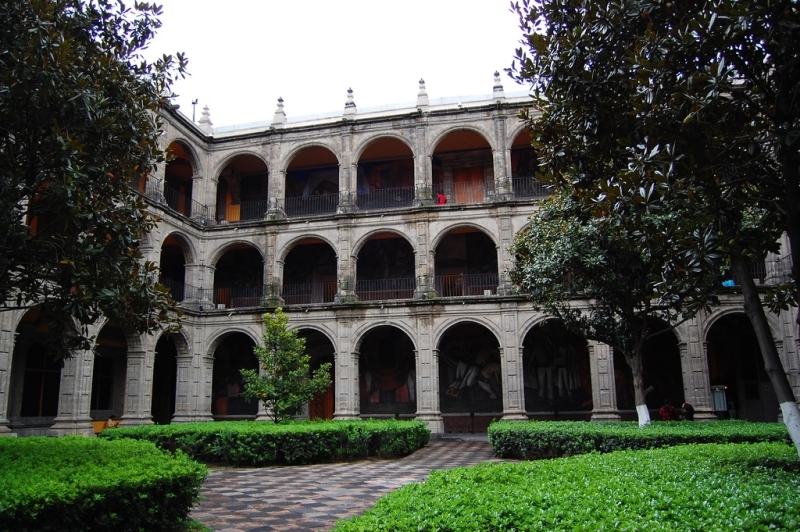 Its foundation by the Jesuits dates from 1588, as a seminary where students resided in the Congregation. 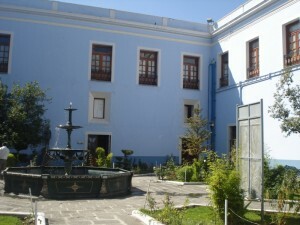 Around 1618 began operating under the Royal Patronage granted by Philip III, establishing the Oldest Royal College of San Ildefonso. In the early Eighteenth century it was rebuilt, leading to the building we know today and is considered one of the most remarkable examples of civil architecture in Mexico City. 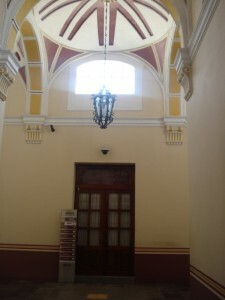 Antiguo Colegio de San Ildefonso (2) by Omar Omar. Image licensed under Creative Commons Attribution-NonCommercial 2.0 license. After the expulsion of the Jesuits decreed by King Charles III in 1767, the building had several functions: the headquarters of a battalion of the regiment of Flanders, school administered by the colonial government and led by the secular clergy, the temporary headquarters of the Law School, a few chairs in the School of Medicine and the headquarters of U.S. and French troops in 1847 and 1862 respectively. The history of the Jesuit Foundation concluded to make way for the institution of liberal spirit that would lay the foundations of the new educational system which would later become the core of the National University. 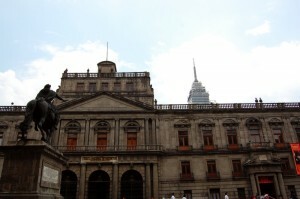 In 1867, Benito Juárez’s government started a reform in the field of education and its institutions. The Organic Law of Education created the National Preparatory School, which was established in the building of the Colegio de San Ildefonso. Its first director was Dr. Gabino Barreda (1818-1881), who conducted an innovative curriculum based on the principles of the positivist philosophy of Auguste Comte. Antiguo Colegio de San Ildefonso (3) by Omar Omar. Image licensed under Creative Commons Attribution-NonCommercial 2.0 license. In 1910, the National Preparatory School became part of the National University founded by Justo Sierra. For more than six decades remained the cradle of several generations of intellectuals and eminent personalities. 1978 was the last year it hosted the National Preparatory School. 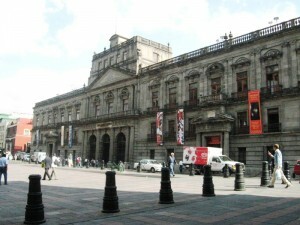 The building remained closed to the public until 1992, when it was renovated to house the exhibition “Mexico: Splendors of 30 centuries”. 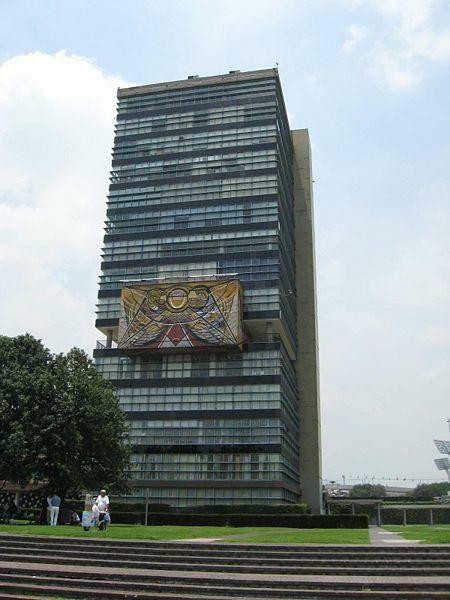 Currently is a museum and cultural center considered to be the birthplace of the Mexican muralism movement. 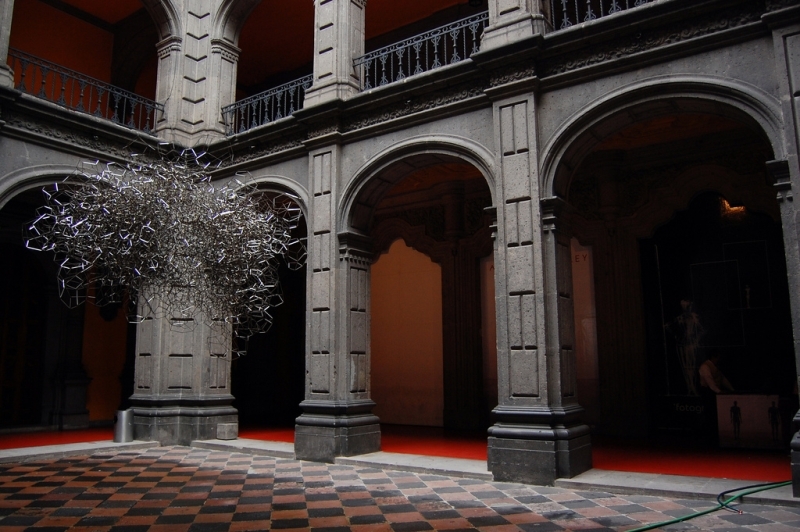 The complex is located between San Ildefonso Street and Justo Sierra Street in the historic center of Mexico City. Palacio de medicina (1) by Carlos Adampo. Image licensed under Creative Commons Attribution-ShareAlike 2.0 license. Palacio de la Escuela de Medicina (Palace of the School of Medicine) is located opposite the main square of Santo Domingo, and was built under the direction of Pedro Arrieta, who began the work on the December 5, 1732 and completed for 1736 Christmas. The frame is adorned on both sides, with four columns and two pillars carved in stone granite, with capitals of composite order. Human face figures, reminiscent of the late Sixteenth century decorate the frieze. The cover art, with an eight-side top, it is an example of Eighteenth century Baroque Hispanic art, provides a framework for the door, on two sheets of thick boards covered and trimmed with sturdy nails. Palacio de medicina (2) by Carlos Adampol. Image licensed under Creative Commons Attribution-ShareAlike 2.0 license. At the second level are repeated details of the ground floor, including the eight-side arch, except the columns replaced by pilasters; the balcony railing is Biscay iron. On the upper level, the top was used to display the emblem of the Holy Office. From the crest on either side, there are rows of battlements that give the impression of solemnity to the building. The large patio is a perfect square, and in every angle the builder makes the arches of the angles remain with nothing resembling the hold. This is the keystone extended to below under “pendatif”, as some descriptions, or “adaraja” as the old Moor builders from Spain used to call it. This beautiful monument of classical art-model of the past century-styled by Manuel Villar and his disciple Soriano, was presented by the Academia de Bellas Artes de San Carlos (Academy of Arts of San Carlos) to the School of Medicine and solemnly inaugurated in the year 1860. Palacio de medicina (3) by Carlos Adampol. Image licensed under Creative Commons Attribution-ShareAlike 2.0 license. Incidentally, the old building of the Inquisition, included not only this house, but also next door, 35 Avenue Brazil, before a number of Third Street in Santo Domingo, acquired in 1915 for the School of Medicine by Dr. Don Angel Hidalgo. Farther north, the buildings where the garages were the inquisitors, the first street in Colombia, for centuries called “street parking” in what is now Venezuela Street, were perpetual prisons , so that the street was called until 1916, Street of Perpetuity. On June 8, 1813 was closed in Mexico the Holy Office under the decree of the Spanish Courts, since on February 22 on the same year was disappeared on Spain. However, Ferdinand VII, he was restored January 21, 1814 until it was finally abolished on 31 May 1820. After several uses like Military College, National Lottery, Lancaster school and state government offices, in 1854 was acquired by Mr. Urbano Fonseca, inspector of public instruction for the School of Medicine. Fig 1. Biblioteca Central (Central Library) by sancho_panza. Image licensed under Creative Commons Attribution 2.0 license. Ciudad Universitaria (University City) is the main campus of UNAM (National Autonomous University of Mexico), erected over a volcanic ground, is located at the south of the country’s capital, a coarse place called El Pedregal (the Rockyland), covered by the lava resulted from the eruptions of several volcanoes more than six thousand years ago (the most important, the Xitle volcano around 100 AD), and since then it invited everyone the contemplation of its exotic landscape. Constructed between the years of 1950 and 1954, University City exemplifies the cultural and political life of Mexico since its construction. The buildings of the Campus clearly show the interpretation of the Modern International Architecture postulates, rationalist, technical, and objective, but at the same time, also of the traditional Mexican architecture. The University City is a true fusion, the result of the union without precedents of the Modern Mexican architects, more than sixty architects interacted to give origin to one of the most emblematic complexes of the Modern Mexico. The stone used as raw material in the construction of the complex evokes directly the tectonics strength of the volcanic mantle, the rooting with the site, and the millenarian past, reflected in the Olympic Stadium and in the Handball Courts: the latter acquire their shape from the pre-Hispanic traditional Ball Game. Both pieces achieve a forceful abstraction and geometric rigor. 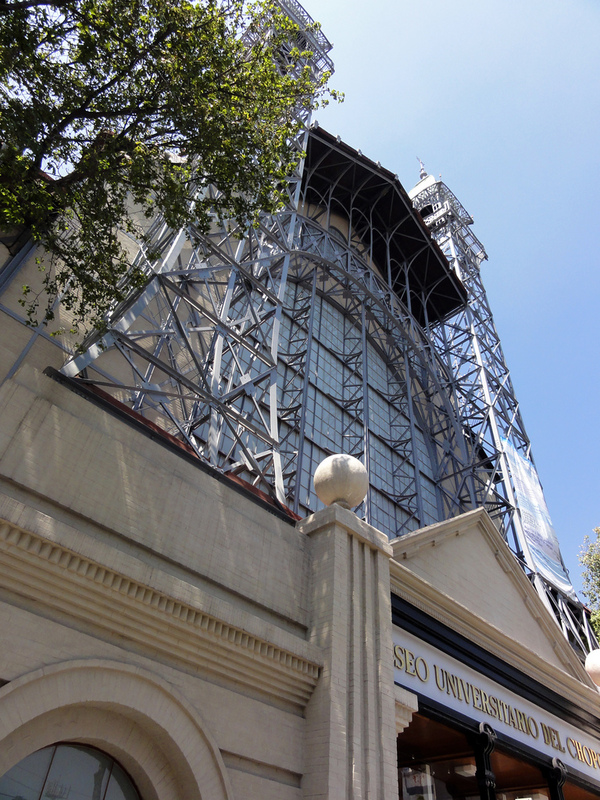 The modernity and technological innovation the country was experimenting at that time are represented with the use of steel, glass and shown concrete, and synthesize the influence form international models of the 20th century. 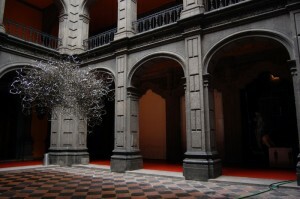 It is the physic concretion of many University members longings to unite the University facilities that were spread around the Historical Center of Mexico City since its origin during the Hispanic time, as it represents the Mexico National Autonomous University presence in the country for more than 450 years. Fig 2.1. Main Administration building by Thelmadatter. Image available in the Public Domain and licensed via Wikimedia Commons. The open space, the setting and the spatial relation appear as a tribute to the pre-Hispanic Mexico, and also, as a promise towards its future. 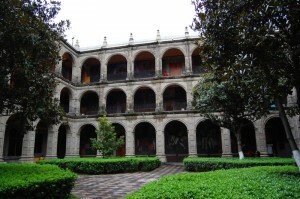 The Campus has architectural exceptionality value due to the syncretism presented by its buildings, where the Mexican architectural tradition its harmonically combined with the most demanding postulates of the Modern Architecture, generating through reflection and integration an identity of its own. University City is in itself an evocation of the modern man, of the site, and its history. Its creation is the same as for the Modern Mexican, it reflects the continuity of the post-Revolutionary Process; the Nationalist Modernity melts with the ideals of the Modern World and the Universal Man. University City stands as a universal symbol for the transmission of culture through time. 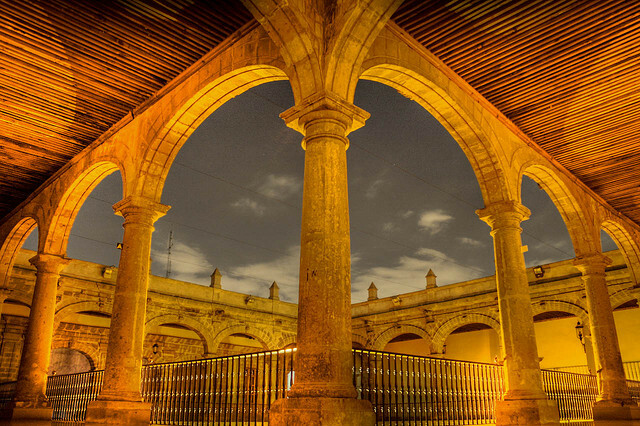 Its particular case is about an institution created during the cultural cross-breeding between Europe and America initiated in 16th century and formalized since 1554, year of the Royal and Pontifical University founding, predecessor of the today Mexico National Autonomous University. Fig 2.2. Main Administration building by Thelmadatter. 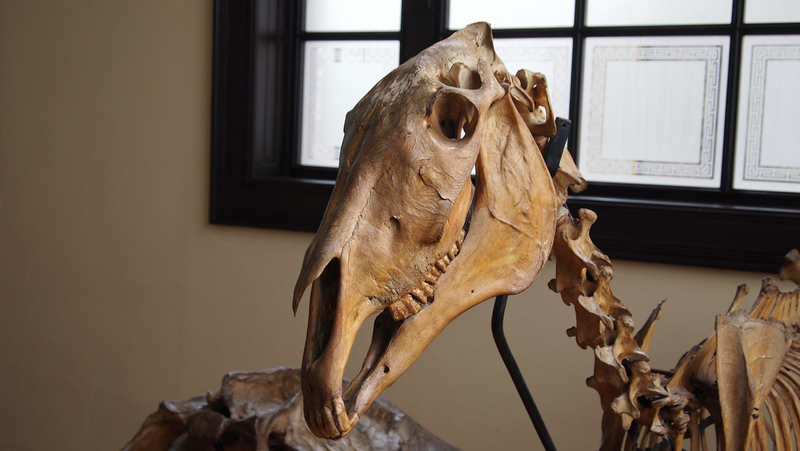 Image available in the Public Domain and licensed via Wikimedia Commons. The aesthetic and social relevance are revealed through the plastic integration on the Campus architecture. The merge of architecture and plastic placed the complex into an ancestral and modern space of time, represented on its murals; Muralism is an integral element of architecture. 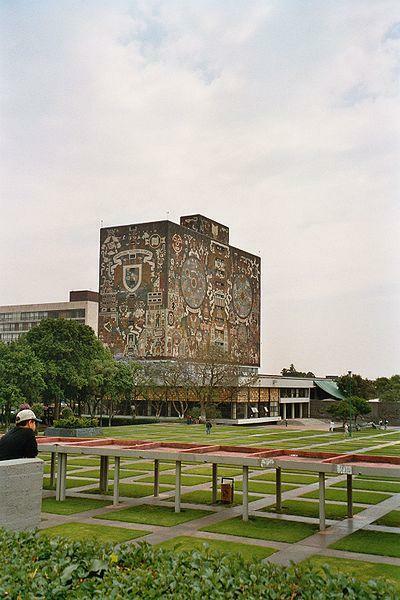 The same way that in the antique Mexican times the codices were used, murals in modern Mexico represent graphically a cultural and didactic message; Architecture and art in the Campus are a metaphor for life and knowledge. 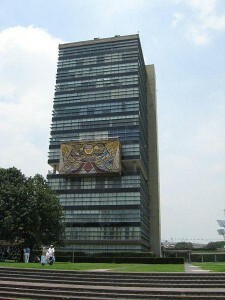 University City is directly linked to the work of outstanding individuals internationally recognized by their contributions into several knowledge fields; scientists and humanists have received the highest level prizes, as the Nobel; artists that have left an invaluable artistic heritage for mankind, and promoted the Mexican culture by using original and expressive languages from the 20th century, such as Muralism. More than fifty years after its creation, the Campus continues as an example of the interdisciplinary collaboration that prevailed among the consulters and specialists in different knowledge fields, with the architects in charge of the translation of the programs into buildings where the majority of Mexican professionals’ generations had studied since. The outstanding environmental value of the Campus refers to the University validity as an example of sustainability and ecological development before the city, by maintaining the vastest Pedregal Ecological Reserve within all Mexico City. University City maintains and preserves within its limits a unique Ecological Reserve that has already been declared under protection. The central space of the Campus central allows to the meeting and coexistence of the University community and the original natural conditions of the site. 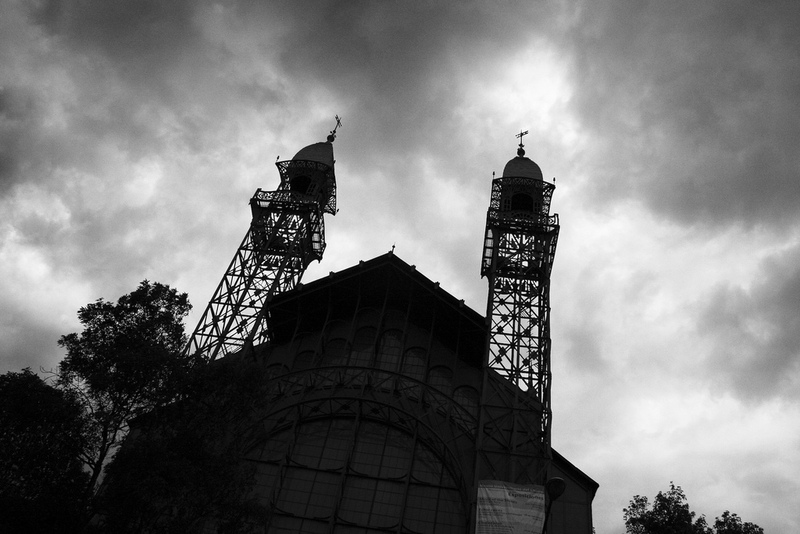 For all these characteristics, University City became an obligate place to visit, for being the main venue of the science and culture in Mexico since the 1950s.